Have you been looking for a natural building envelop that has superior thermal performance for your new construction project? Nexcem ICF are the only reinforced insulated concrete forms that do not use foam or polystyrene, and, instead, use a proprietary wood concrete material (cement-bonded wood fiber material). Nexcem Insulated Concrete Forms provide better insulation (R-values), offer better moisture resistance, a consistent performance year after year, high wind load, high fire resistance, termite resistance, sound deadening, fast installation, it never rots or decays, and many other benefits. Our Insulated Concrete Forms construction solution is proven, tested, and guaranteed to provide you with a better return on investment than any conventional construction method. There are several projects already built with Nexcem ICF in the city of Ottawa, Ontario, and it is our aim to expand this success throughout the provinces of Quebec and Ontario. 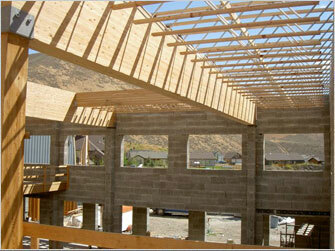 There are many advantages in the Nexcem ICF system, over the conventional ICF and the conventional stick framing. Because these forms are made of cement bonded wood fiber material, they permit avoiding the use of unnatural products, while allowing for a better thermal performance. They also give it more solidity than Styrofoam ICF, eliminating blow-outs completely if the manufacturer’s instructions are followed. Traditional Insulated Concrete Forms (ICFs) are hollow EPS forms that are erected at the construction site, and then filled with five or six inches of reinforced concrete. Unlike traditional concrete forms, Nexcem ICF does not use EPS or any other chemical material, making it a healthier choice for the occupants of the building. Nexcem ICF blocks give you all the benefits that have made concrete the material of choice for home building worldwide: solid, lasting construction that resists the ravages of fire, wind, and time. With a 4-hour fire rating, and a zero-smoke and flame spread ratings, unlike regular ICF, Nexcem ICF do not melt, and sustain fire or off-gas toxic smoke, in case of fire. The sound absorptive properties of Nexcem ICF, in combination with the mass of the wall system, provide an ideal combination of sound attenuation properties. About 95% of the sound that reaches the Nexcem material is absorbed and not reflected. This makes it the perfect solution for any kind of building, independently of its application, to keep the occupants away from noisy surroundings. The cement content of the Nexcem material creates an above average pH environment at the wall surface, that inhibits the growth of fungi and mold. Additionally, the hygroscopic nature of the material moderates humidity levels of the building and provides an inherent moisture regulator that keeps humidity low, repressing any type of fungal growth. Since Nexcem is a natural product, there is no presence of VOCs or off-gasing of any sort. Applying standard stuccos directly to the Nexcem ICF results in a finishing that is less expensive and more impact resistant than conventional EIFS systems (polystyrene and stucco). Unlike wood or other non-hygroscopic material, Nexcem ICF provide effective resistance to termite attack. Several tests have been conducted by independent agencies, such as the U.S. Forestry Service, where Nexcem samples were placed in termite infested areas, for as long as six years, without any destruction of the Nexcem material. With the Nexcem ICF system, you can earn LEED points in virtually all LEED categories, from “Sustainable sites” to “Innovation & Design”, and all categories in between. Most importantly, it will help you collect points on the “Energy & Atmosphere” category, which is the category with the most possible points.